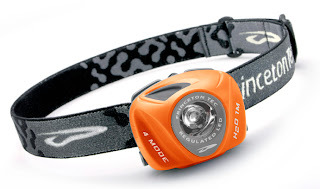 The EOS is a LED headlamp using a 1 watt luxeon LED powered by 3 AAA batteries. It has 4 modes of operation, maximum brightness, medium, low and blinking mode. The modes are selected using a single switch at the top of the lamp head, press once to turn on in maximum mode, press again for medium, press again for low mode, again for blinking mode and again to turn off. If you let the light on for about 2 seconds a press will just turn it off, it won't switch modes. The EOS can load either alkaline, rechargeable NiMh or lithium batteries, the runtime is 6 hours in maximum brightness, 12 hours in medium and 60 hours in the low mode. The blinking mode is useful for signaling or attracting attention and can be used for 50 hours. One of the nice things about the EOS is that the output is regulated, regardless of the battery status the brightness will be constant at each selected level. A heat control mechanism prevents the LED from overheating if that happens the EOS automatically goes down to a lower brightness level. The beam is strongly focused for throw, so even with a 1 watt LED the EOS will perform very well outdoors being able to illuminate your path and reach distant objects, for indoors activities or camping you will probably be better with a lower brightness setting since a strong hotspot will not be needed. According to the manufacturer the EOS is weather resistant and can be used up to 1 meter below water. The headlamp is very easy to use and confortable weighting only 105gr you put it on and forget it is there, can run for a long time and is bright enough to compete with bigger and bulkier lamps in outdoor hiking and other activities. Definitively a very good option if you need a headlamp. You can read more and order for about $35 from Princetontec's website. 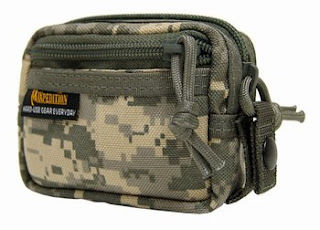 The three by five is a small pouch by Maxpedition measuring as it name suggests 5'' by 3'' with 1.5'' of depth. The pouch is designed to be carried and attached as an accesory pouch to a backpack or a bigger bag but it can also be certainly be used as a standalone element. The 3x5 has two compartments accesible via zippers, there is also a flat small unzippered pocket at the front that can be good for a card or some cash. The main compartment's zipper can be secured with a button-lock to avoid unintentional opening of the pouch. At the back of the pouch there are modular attachment loops for a belt or to attach the pouch to something else using Malice clips. The construction in reinforced Nylon is extremely strong, the zippers run very well and seem to be extremely strong. The pouch is good to carry a GPS, a small digital camera or some accesories that need quick access from outside of a backpack. It can also be used to carry accesories from a belt loop. It is available in black, green, khaki and ACU camo for $20. Check it or order from Maxpedition. This is a small travel kit from Nalgene designed to carry some personal items such as shampoo, perfume or maybe your preferred sauce complying to air travel regulations. 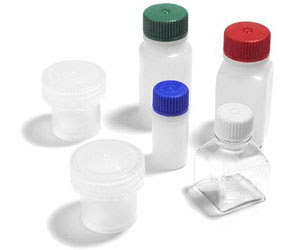 The kit contains 6 flasks, the blue cap bottle fills 1/2 ounze, the red cap is 2 ounces, the green cap is also 2 ounzes, the square flask is 1 ounces and the two straight sided bottles hold 1 ounce each. The bottles are made of very strong plastic and are tested to be leak proof even with changes of pressure as expected when traveling by plane. Each bottle in the kit can withstand temperatures from -100ºC (-148ºF) to 120ºC (248ºF) and they can be cleaned in the dishwasher without problems. A good kit for travelers and a good set of flasks or bottles for your EDC kits. You can read more and order for $8 from Nalgene. 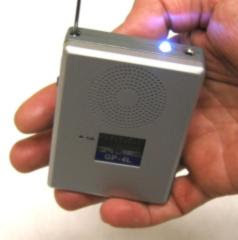 The GPL4 is a very small multi-band radio. It features AM, FM and 2 bands of Shortwave (SW) reception. The radio has a digital display that shows the time when the radio is off or the selected radio station in digital mode when the radio is on, you can also program an alarm that will turn on the radio at the specified time so it works as an alarm clock or travel clock. There is also a small LED at the top that can be used as a flashlight if you need some light at night or in an emergency. The station is selected with a knob on the side and displayed in the small LCD display, a red led turns on when the reception is clear, another knob controls the volume. The internal speaker is ok but you can also use headphones and then FM can be listened in stereo mode. The antenna is telescopic and works in the reception of both FM and SW bands, for AM the internal ferrite antenna does the job. The dimensions are 3.4" X 2.55" X .83" and the total weight without the batteris is 85 grams. Small enough for a shirt pocket. The radio can use two AA batteries or be plugged to a 3.5v powersource (not included). The runtime is about 150 hours for the radio and about 70 hours for the flashlight (mutually exclusive). It is a very small radio with nice features and good reception, there is also an optional larger antenna for improved SW reception if needed. The construction quality and performance are really good from our tests. You can get it from CountyComm for $25. 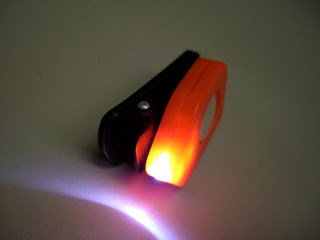 The ARES so-led is a small keychain flashlight, using two C2016 coin cell batteries to power a 5mm white LED. The case is made of orange plastic with a sliding switch, there is no momentary push operation, only slide on-off activation. The body has a plastic ring to attach a split ring or a lanyard at the back. The light is attached to a black crocodile clip and can rotate, you can use the light clipped to a backpack, pocket or belt. The construction of the light, specially the body is quite cheap, the plastic is not very strong and there are details in the finish. In terms of performance the light is bright, the LED won't probably have a very long lifetime but for the price and the construction it will survive the expected lifespan of the light. 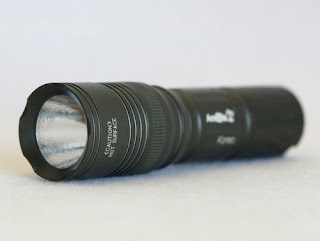 The T5 is a single cell light from Korean manufacturer Amilite. The light uses a Seoul LED which is brighter and stronger than Luxeons, and it has two brightness levels. The light is operated by a reverse clickie switch at the back, press to get the low mode, press again for high and press again to turn it off. You don't need to fully depress the switch to turn it off and on again to switch levels, a light press will be enough to turn the light momentary off and on again switching levels. The light can use either a 123 lithium cell or a rechargeable cell. The runtime is about 1 hour in maximum brightness and 10 hours in low mode. The body is constructed with HAIII anodized aluminium very strong and able to resist scratches and impacts when used, o-rings make the light water resistant. The T5 is a bright light the manufacturer announces 140 lumens on high but the real value might be close to 95 according to our tests and comparissions. The reflector is textured producing a very smooth beam that has a good balance between throw and sidespill making the T5 a general purpose light. The T5 is 3.70 inches long (94mm) a good size for EDC and pocket carry. The light is regulated so in max brightness you will get a constant level of output regardless of the battery status. A nice general purpose single cell light with two stages.